Much of the equipment described in this section has been used for centuries. Many variations of the basic designs have been used throughout the years. Some are more efficient than others. Most have low capacity and do not efficiently recover fine gold. Only the most useful, simple, inexpensive, or easily constructed of these old but practical devices are described. Perhaps the oldest and most widely used gold concentrator is the gold pan. Although available in various shapes and sizes, the standard American gold pan is 15 to 18 inches in diameter at the top and 2 to 2 1/2, inches in depth, with the sides sloping 30-45 degrees. Gold pans are constructed of metal or plastic (Photo 1) and are used in prospecting for gold, for cleaning gold-bearing concentrates, and rarely, for hand working of rich, isolated deposits. A gold pan concentrates heavy minerals at the bottom while lighter materials are removed at the top. The basic operation of a pan is simple, but experience and skill are needed to process large amounts of material and achieve maximum recovery. Panning is best learned from an experienced panner, but the general principles and steps are outlined below. For maximum recovery, the material to be panned should be as uniform in size as possible. Panning is best done in a tub or pool of still, clear water. First, fill the pan one-half to threefourths full of ore or concentrate. Add water to the pan or carefully hold the pan under water and mix and knead the material by hand, carefully breaking up lumps of clay and washing any rocks present. Fill the pan with water (if not held underwater) and carefully remove rocks and pebbles, checking them before discarding. Tilt the pan slightly away and shake vigorously from side to side with a circular motion while holding it just below the surface of the water. Removal of lighter material is facilitated by gently raising and lowering the lip of the pan in and out of the water. The pan may be periodically lifted from the water and shaken vigorously with the same circular motion to help concentrate materials. Large pebbles should be periodically removed by hand. Panning continues until only the heaviest material remains. Gold may be observed by gently swirling the concentrate into a crescent in the bottom of the pan. Coarse nuggets are removed by hand, while finer grained gold may be recovered by amalgamation. An experienced panner can process one-half to three-quarters of a cubic yard in 10 hours. 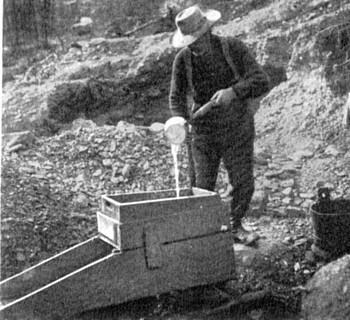 Panning was widely used as a primary recovery method in the early days of mining. However, the process is extremely limited, as only coarse gold is recovered, while very fine particles are usually washed away with the gravel. Only small amounts of gravel can be processed, even by the most experienced panners. Today the gold pan is used mostly for prospecting or for cleaning concentrate. Its low price, immediate availability, and portability make it an essential tool for the prospector or miner. One of the first devices used after the gold pan was the rocker. The rocker allowed small operators to increase the amount of gravel handled in a shift, with a minimum investment in equipment. 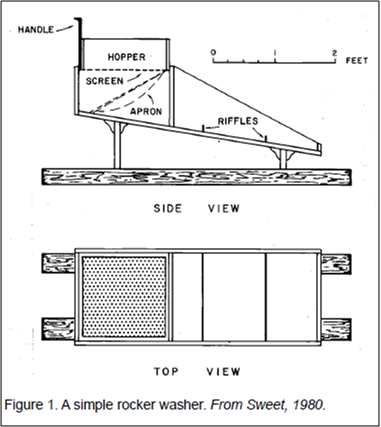 Rockers vary in size, shape, and general construction, depending upon available construction materials, size of gold recovered, and the builder’s mining experience. Rockers generally ranged in length from 24 to 60 inches, in width from 12 to 25 inches, and in height from 6 to 24 inches. Resembling a box on skids or a poorly designed sled, a rocker sorts materials through screens. (Figure 1). K. Apron, made of 1 in. x 2 in. strips covered loosely with canvas. For cleats and apron, etc., 27 feet of 1 in. x 2 in. lumber is needed. Six pieces of 3/8 in. iron rod 19 in. long threaded 2 in. on each end and fitted with nuts and washers. L. The handle, placed on the screen, although some miners prefer it on the body. When on the screen, it helps in lifting the screen from the body. the center to hold the spike in the rockers are also required. These are used as a bed for the rockers to work on and to adjust the slope of the bed of the rocker. the rocker is in use. The apron (K) is a frame nailed together, and canvas is fastened to the bottom. Joints at the comers should be strengthened with strips of tin or other metal. 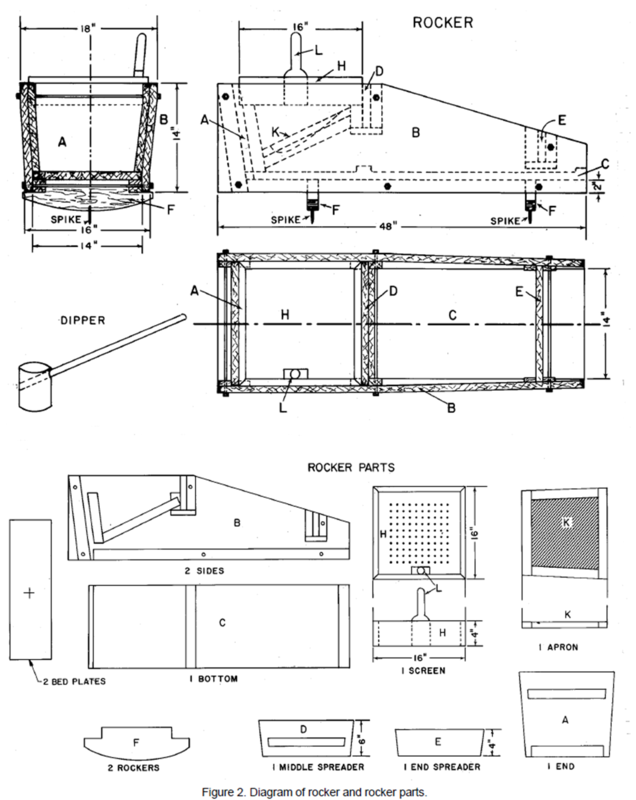 Place bottom (C), end (A) with cleats inside, middle spreader (D) with cleat toward A, and end spreader (E) in position between the two sides (B) as shown. Insert the six bolts and fasten the nuts. Rockers (F) should be fastened to bottom (C) with screws. Set apron (K) and screen (H) in place, and the rocker is ready for use. If one-quarter-inch lag screws are driven into the bottom of each rocker about 5 inches from each side of the spike and the heads are allowed to protrude from the wood, a slight bump will result as the machine is worked back and forth. This additional vibration will help to concentrate the gold. If screws are used, metal strips should be fastened to the bed-plates to protect the wood. Gravel is shoveled into the hopper and the rocker is vigorously shaken back and forth while water flows over the gravel. The slope of the rocker is important for good recovery. to perhaps only an inch. The rate of water flow is also important. Too much water will carry the gold through the rocker without settling, and too little will form a mud that will carry away fine gold. Water may be dipped in by hand, or fed with a hose or pipe. It is important to maintain a steady flow of water through the rocker. When all the material that can pass through the screen has done so, the screen is dumped and new material added and washed. The process continues until it is necessary to clean the apron. Frequent cleanups, on the order of several times a day, are necessary for maximum recovery.